Taylor’s is one of the most highly respected producers of aged tawny Port wines. The 10 Year Old is a blend of magnificent tawny from its extensive reserves of old cask aged Ports. 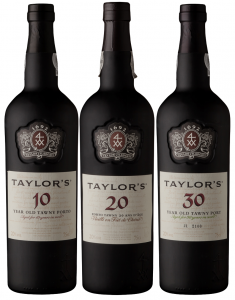 Taylor’s is one of the few remaining houses to produce a 30 Year Old aged tawny Port. Only every two or three years is a reserve of Port with sufficient structure, fruit and power to age is laid aside to age in oak casks. Those that have reached their peak after thirty years are then blended together for balance and finesse. This is one such wine. All these ports are great. The 10 year old is smooth and easy to drink. The 20 year old had a richer fuller flavour. The 30 year old is even more distinctive and probably the best port I have ever had. WTF??? This is meant to be a beer site, not for comparing posie middle-class drinks like port. What next? Are we going to be tasting quinoa? – what ever that is!